Automotive maintenance and repair is a rapidly changing field. Today’s auto technician needs a working knowledge of electronics and technology. SFCC offers a range of classes that give beginning students, as well as those wanting to update their skills, the specialized training needed to work on today’s advanced vehicle systems. Gain Automotive Service Excellence (ASE) Certification in up to seven competency areas, including Automotive Engine Repair; Auto Maintenance and Light Truck Repair; Automatic Transmission Transaxle; Automotive Heating and Air Conditioning; Brakes; Manual Transmission and Drive Train; and Steering and Suspension. Associate professor and program director Gilbert “Gilly” Sena, has taught college-level automotive technology classes since 2001. He owned an automotive repair business and has worked as a service manager and service technician at dealerships around the state. The U.S. Bureau of Labor Statistics projects that jobs for automotive technicians and mechanics will grow by nine percent by 2022. Salaries can range from $38,000 to $47,000 and all the way up to six figures. 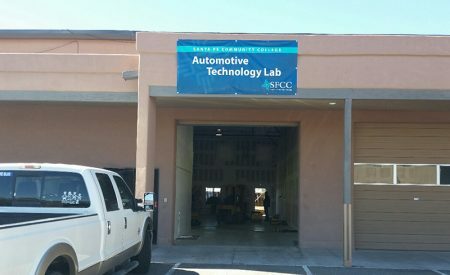 SFCC’s Automotive Technology Lab in its new location on Bisbee Court. Thanks to a partnership with Snap-On Tools, students can purchase their tools at a greatly discounted rate. All classes are taught by ASE Certified Technicians. Marketing funding for this program provided in-part by the Carl D. Perkins Education Grant. Gil spoke about the new program with Chuck Zoback on the Veteran’s show at KVSF 101.5 FM. Listen to his interview with Richard Eeds.